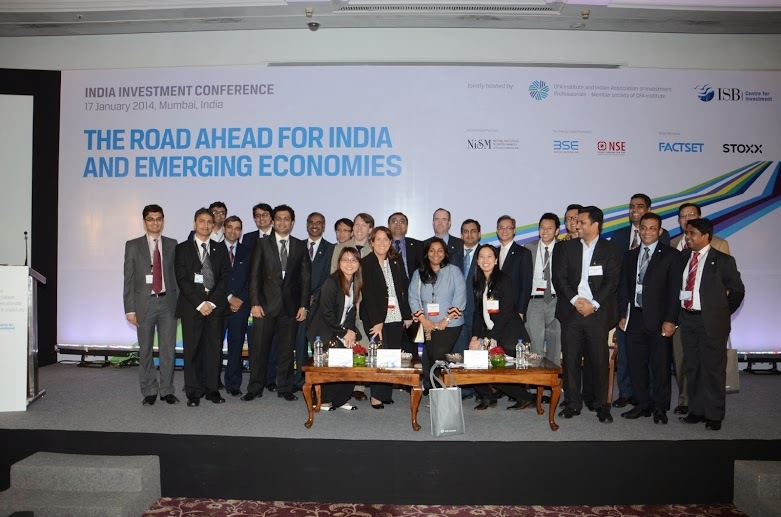 The fourth India Investment Conference held on January 17th 2014 at Mumbai, was yet again received with enthusiasm by the members. It had plenary sessions by distinguished speakers like Avinash Persaud (Chairman, Elara Capital and Intelligence Capital and adviser to India’s FSLRC), Richard Duncan (Chief Economist, Blackhorse Asset Management), Frederic Lebel, CFA (Co-CEO of OFI MGA and owner of HFS Hedge Fund Selection S.A. and Planning Committee Chair of CFA Institute Board of Governors) and Dr. Fereidun Fesharaki (Chairman, FGE) in that order. The last session was the panel discussion on investment in Indian markets with illustrious market experts like Samir Arora (Founder, Helios Capital), Manish Chokhani (MD, Alliance Holdings), Abhay Laijawala (Head of India Equities Research at Deutsche Bank), and Jayesh Mehta (MD & Country Treasurer, Bank of America (India)). Each of the session was moderated by yet another set of reputed professionals like Navneet Munot, CFA (Director IAIP & CIO SBI Funds Management), Sandeep Sabharwal, CFA (Senior Director Capital Markets, CRISIL Research), Paul Smith, CFA (MD, APAC, CFA Institute) Namit Arora, CFA (Vice President IAIP and Director, Standard Chartered Private Equity) and Sunil Singhania, CFA (CIO Equity Investment, Reliance Capital and member of Board of Governors at CFA Institute) respectively. The welcome and inaugural addresses were made by Paul Smith, CFA (MD APAC, CFA Institute), Jayesh Gandhi, CFA (President, IAIP and ED, Morgan Stanley Investment Management, India) and Vikram Kuriyan, CFA (Director, Centre for Investment at ISB). Anil Ghelani, CFA (Director, IAIP and Business Head & CIO DSP Blackrock Pension Funds) was the conference moderator. 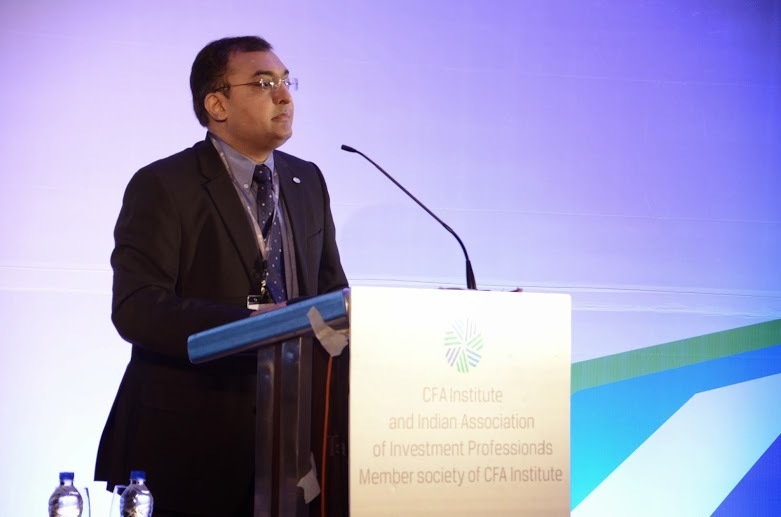 Vidhu Shekhar, CFA (Consultant, CFA Institute) closed the conference with a vote of thanks. CFA Institute, ISB (Indian School of Business) and IAIP were the host of the events. NiSM was the knowledge partner. Sponsors include Factset, Stoxx, BSE and NSE as Gold Partners and S&P Capital IQ as Silver Partners. Exhibitors include Morningstar and Thomson Reuters. Supporting Partners include Ambit, DSP BlackRock and Reliance Mutual Fund. In the Inaugural address, Paul Smith, CFA updated the audience that CFA Institute’s members’ outlook on India’s economic growth is most positive in the entire non-Japan Asia. However, he reminded the audience on need for a stable source of financing to achieve this growth and highlighted the role of channelization of India’s domestic savings in productive investment to achieving sustainable economic growth. He also touched upon the findings by Economist Intelligence Unit wherein it found that ethical behaviour needs to be encouraged by the senior executives and top management and linkages in ethical behaviour, company profitability and career progression need to be formed as 50% surveyed feared that adherence to a strong ethical code may come in the way of their career progression. Finance industry continues to be the least trusted industry globally for three years in a row as per Edelman Trust Barometer. Paul also highlighted that under this backdrop as a leader in ethics education, CFA Institute is committed to promotion of ethical behaviour in investment industry. 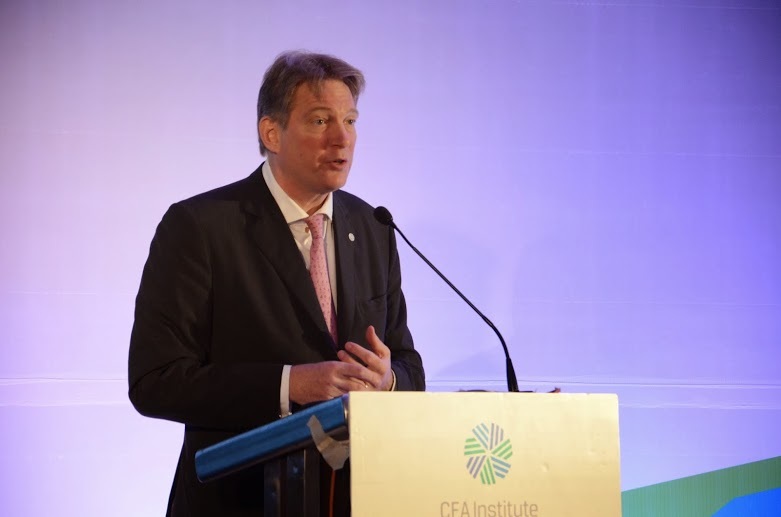 Paul also took this occasion to reiterate CFA Institute’s commitment to India and announced the plan to open its India office with 5 people in the next 6 months. Access scholarships – last year 250 access scholarships were given covering almost one in every four candidates, etc. Jayesh also updated that all these activities have been managed on an entirely voluntary basis and taken the occasion to thank the key 30-40 volunteers across India for their continued support. 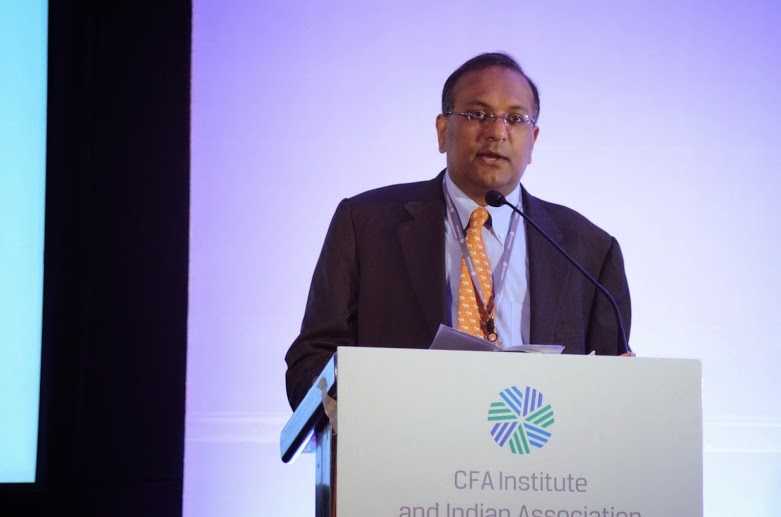 He highlighted that India is now the third largest in terms of number of CFA candidates and welcomed the CFA Institute’s move to open an office in India to be able to better serve the candidates and members. Vikram Kuriyan, CFA, informed the participants on ISB’s centre for investment and its labs in areas of (i) investments, and, (ii) risk and governance. Based on the research performed in the investment lab he emphasised the need for diversification of portfolios including access to global products for Indian investors. He highlighted that though in times of crisis correlations in markets significantly increase but in the long run a globally diversified portfolio turns out to be the most optimum. Ironically, global pension funds invest into Indian equities while its own pension funds don’t do it. Job of the professionals is to develop products that truly add value to the society and that’s the road ahead for India’s investment professionals. This entry was posted in Events, India Investment Conference and tagged Abhay Laijawala, Alliance Holdings, Ambit, Anil Ghelani CFA, Avinash Persaud, Bank of America India, Blackhorse, Bloomberg, BSE, CFA Institute, Chetan Shah CFA, CRISIL, Deutsche Bank, Dr. Fereidun Fesharaki, DSP Blackrock, Economist Intelligence Unit, Edelman Trust Barometer, Elara Capital, Factset, FGE, Frederic Lebel CFA, Helios Capital, HFS, IAIP, IIC-14, Indian Association of Investment Professionals, Indian School of Business, Intelligence Capital, ISB, Jayesh Gandhi CFA, Jayesh Mehta, Manish Chokhani, Morgan Stanley Investment Management, Morningstar, Namit Arora CFA, Navneet Munot CFA, NSE, OFI MGA, Paul Smith CFA, Priyank Singhvi CFA, Richard Duncan, S&P Capital IQ, Sameer Arora, Sandeep Sabharwal CFA, SBI Funds Management, Standard Chartered Private Equity, Stoxx, Sunil Singhania CFA, Thomson Reuters, Vidhu Shekhar CFA, Vikram Kuriyan CFA. Bookmark the permalink.